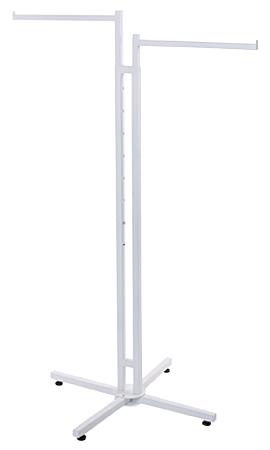 The White 2-Way Clothing Rack- Straight Arms is a classic rack with a stylish twist. The height can range from 48" - 72"H adjustable in 3" increments. Simply push the buttons and slide the arms up or down to your desired height. This rack has a 26" x 26" base with adjustable leveler glides.